Support the Underprivileged Women and Girl Artists!! Do you love art and craft? Do you appreciate the creativity and imagination of an artist? Do you feel proud on the Indian art? I do love and appreciate the art and creativity. With the curiosity to explore these artists, I came across a bitter and sad picture of the women artisans’ life and their struggle. With my passion and love of art, I have decided to help these artists to overcome the problems they face. I would like to invite you all to make little efforts and contribution to change the life our artisans are living and give them a fair chance of improving their productivity and creativity. The above quote by great artist M.F. Hussain describes the passion and dedication of an artist. The artisan is an important factor in the equation of any society and culture. But this is really sad to know that while other countries continue to recognize and appreciate the Indian art; surprisingly we remain clueless about the same. According to the UN, the number of Indian artisans has decreased by 30% in past 2 decades, indicating the need to re-invest in artisans to safeguard history, culture and an important source of livelihood. Despite being really talented, creative, skillful, and given the high popularity of the Indian art and craft worldwide; rural artisans in India don't get fair compensation and due respect. Currently, the sector carries the stigma of inferiority and backwardness, and is viewed as “decorative, peripheral and elitist”. The said condition of the craft sector is because of being majorly a home based industry resulted in Unorganized production; Outdated production method; Lack of funding; Lack of modern Design inputs; Lack of market linkages; Dominance of middlemen and Lack of adequate training. Most craft people have learned their skills from their fathers or mothers since caste and family affiliations, rather than training or market demand, have primacy in the Indian situation. Artisans themselves are limited to traditional designs, and do not have formal training in design or skill-development and therefore rely on external support reducing themselves to handicraft laborers. In the face of constant struggle, most artisans have given up and moved away from their traditional occupations. The skills, evolved over thousands of years, are being dissipated and blunted. Research indicates that neither the crafts persons nor their progeny want to join the crafts sector, only a lack of available alternatives forces them to do so. They would not mind the tradition coming to an end. We strongly believe that to spread the message of crafts and culture we need to engage both the rural and urban audiences. We aim to work with underprivileged artisans and women's groups living in suburban areas and rural areas with not much access to great opportunities. 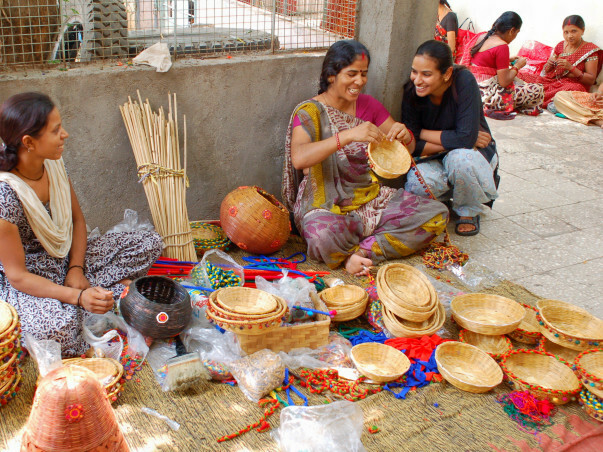 Majority of the artisans are subsistence farmers or work as daily wage laborers. With other livelihood opportunities available; and limited demand for handicrafts, pursuing their craft is not a lucrative livelihood option. Through our little efforts to solve this problem, we are looking to help women artisans to develop a sustainable livelihood through providing them skill development programs, learning design, educating them about basic of entrepreneurship and develop markets for themselves through our help and social working model. The women Self Help Groups created by us will have following significant characteristics and work towards developing and helping these women artists. Proper Coordination between young artists mind and skillful women artists. Workshops; sessions and skill development training focusing over design building, understanding consumer demands, marketing, use of technology and practicing other better working method to be given by professionals. Every self -group involves hiring services of various professionals and economic support for material during the skill development and later while establishing ventures. An Online Platform will be created to showcase work done by them and connect them directly to audience, focusing on getting them fair compensation they deserve for their work and due respect. Participation in Online and Offline Exhibition from time to time to give them motivation and make market aware. Women participants will co-owned the group and work as an entrepreneurial unit making them sustainable, financial sound and self-motivated. Skill Development sessions and workshops focusing on better competitive designs and quality. Motivating and educating them about uses of technology in the business. Market awareness and understanding of Buyer’s Requirement to make them use their creative skill and artistic talents to create products which carry good selling value. Women participants will learn basics of entrepreneurship. Soft Skill training to develop their market representation. Developing the online marketplace and connecting them directly with buyers with the use of e-commerce and institutional buyers. Participation in various exhibitions to showcase their creativity. With the fund raised, self-help groups shall be created capable of bearing the operational and capital cost of the enterprise and shall prove worthy of creating sustainability in their life. The money shall be put in by SHG to procure machines helping them to increase the productivity and efficacy of the enterprise. Hiring Professionals for development session. Supply the quality raw material. Developing the technology within Self-groups to better coordination and working. Social Awareness of the project. Taranpal Kaur Chadda: An Artist by heart, a young girl based in Mumbai, always keen to help women artists in slums of Mumbai. Ashish Sehra: Well Versed with working in corporates, will help to create the coordination and system between various self -help groups. Bhawna: A content writer by profession, she will take care of marketing and relationship building with corporates and building e-commerce platform. More than 100 women artists will get work opportunities and become self-dependent. Through our little efforts we can motivate thousands of artists to adopt the artwork again. We will be developing the standardization and competitive product designs to compete with different craft industries throughout the world. A proper supply chain and marketplace for these artists to sell their products directly to consumers. This money goes 100% to build the Self Help groups that will engage hundreds of women artists over the years. Your donation directly supports all the infrastructure reaching and developing these women artists and communities and creating professional's network social impact to support underprivileged artist communities. We will be updating to all of our supporters about the development we make from time to time. We will be giving away the various discount offers to our supporters, which can be used to buy the products created by our members’ artists from time to time. No amount is too small. If everyone reading this message makes a small donation even we’d reach our goal very soon! We are passionate about nurturing and building a better artistic ecosystem and with your support, we'll get where we want to be in an accelerated way. Please take one minute to support our work and growth in 2017. Please donate and invite others to join you. For any query or get in touch with me you can write me at juhichadda15@gmail.com. I will be happy to connect to you. Thank you for the support. We are glad to get your support and another 10 women have joined us in the journey. We have empowered more than 50 women artists till now. they are able to make decent living now by making jewelry for 5 e-commerce stores. Just because of your support and contribution, We are able to set up one more centre for 20 women artists . We soon will be able to sell goods online and help financially these artists.